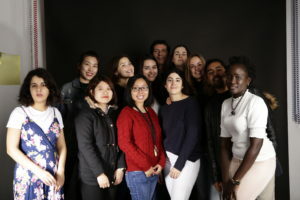 Yesterday, some of our students of Photography applied to Advertising and Digital Marketing went to a photography studio. There they had the opportunity to live and feel like real professional photographers. First, they took some portraits of their colleagues and then they posed as real models. They also had the chance of managing the situation, providing instructions and giving free rein to their imagination. In the second part of the class they took some pictures of a product and due to the internationality of our school, one of our international students, brought some typical sweet from Turkey- of course, at the end, they ate them! Students affirmed it was a really nice and enriching experience where you can learn the different ways of exposing and preparing a product for a shooting advert. Because don´t forget that one of the first rules of marketing is catching the attention of the consumer through the visual part, so this class gave us the chance of learning some tricks for our professional careers. In order to enroll in our programs it is necessary to pass an admission process. To register you must pass an admission process. Leave your data and we will contact you. To register it is necessary to go through an admissions process. Leave your contact details and we will get in touch with you. Данный веб-сайт использует файлы куки для улучшения навигации.